The best shed building tools, as you might have guessed from the pictures above, are helpers! 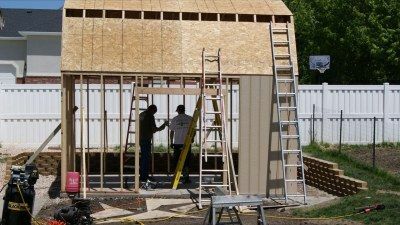 How do you make your shed building experience a fun one and more memorable? By getting your family and friends involved! Of course once you get them all rounded up, you are going go need some tools to give them. 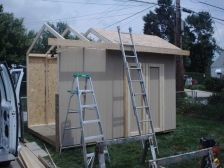 So, here's a list of the shed building tools you can divvy out to family and friends. I wonder if this tool works by itself? As always, safety should be the number one concern when using any tool, especially the air tools shown below. Can Your Wife Do This! For building a shed, this is my number 1 tool to have, a framing nailer. 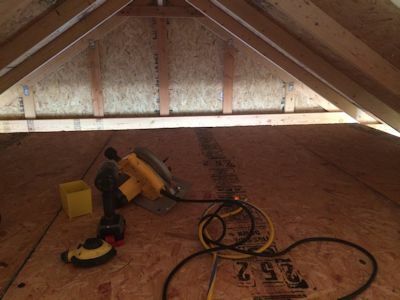 I have had the paslode nailer above for 20 years. They last forever if you take care of them! It is of course optional. 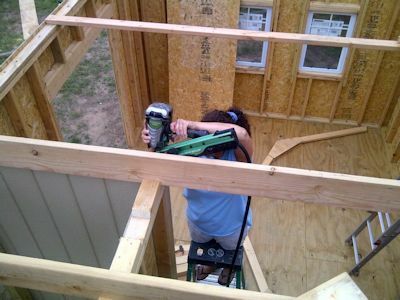 You can absolutely nail all your framing by hand, but it is SO HARD TO BUILD A SHED WITH A HAMMER! It will slow you down, and wear you out! You can build your floor, walls, frame your roof, and nail your siding on with this baby! Need to be careful though. This tool can do some serious damage to your body if you don't know how to properly use it. Having an air compressor is a must have to run your pneumatic air tools with. The one shown above is a 135 psi. 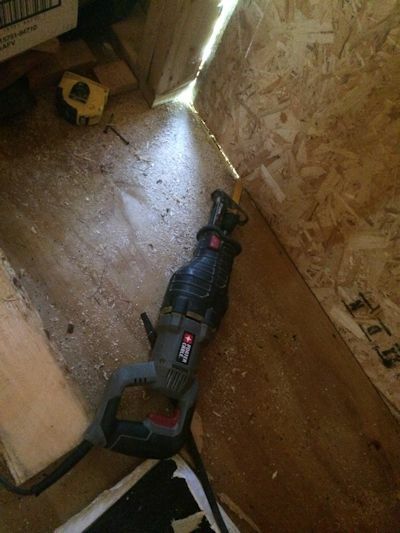 Anything smaller may not run your framing nailer efficiently and definitely slow your shed building down! Having an extension ladder to get up to the roof is a must have in most shed building projects. The sawsall comes in handy when cutting out door panels or window panels. 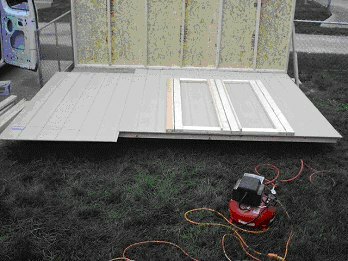 The picture above is showing my sawsall to cut the door panels out for my wife's garden shed that I have been building. 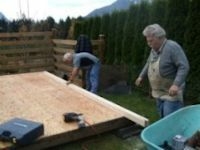 Making shed doors is easy but you will definitely need this tool to do it with. 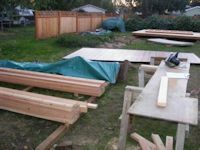 I can't imagine building a shed without my circular saw! 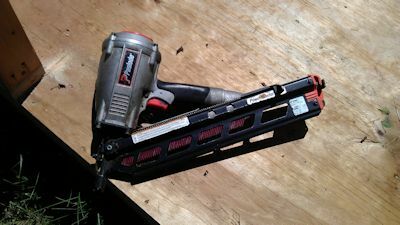 I use it to make all my cuts no matter whether I am cutting ends of rafters, or trimming down siding. I am cutting flooring panels for the loft in my wife's garden shed in the picture above. 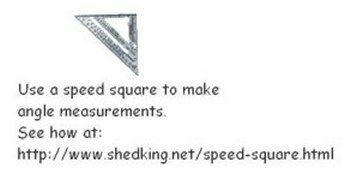 I have found the Swanson Speed Square to be an invaluable tool when making angle measurements for truss and rafter ends. You can get a metal one or plastic. The metal is a better investment as it will not break like the plastic ones do. You can also use the speed square to make straight cuts when cutting with a circular saw. Just position the straight edge of the square on your lumber, put your circular saw against the square so that your blade is lined up with your cut mark, then cu away. Perfect straight cut! Have you used a handy shed building tool that I haven't listed above? If you have a tool that you would like to add to this list, please contact me.